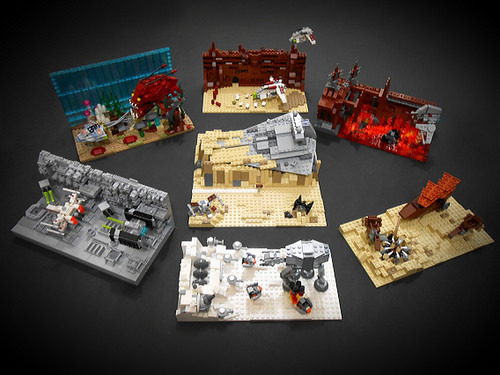 Over the last few months, Irwan Prabowo has been posting a series of microscale LEGO dioramas inspired by all of the Star Wars movies, including the upcoming The Force Awakens. My favorite is the crashed Star Destroyer seen in the trailer for the new movie. 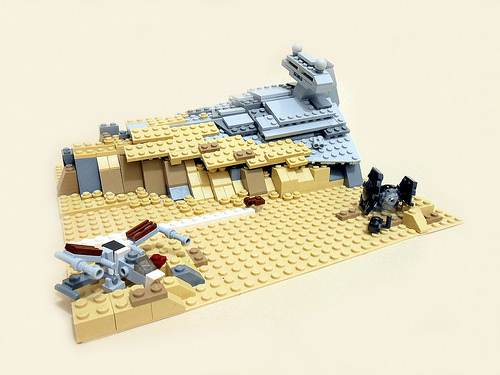 An X-wing and TIE fighter in the sands add some additional visual interest to a scene that might otherwise be a bit more plain at this scale. To see all of them in detail, plus some more not in the group shot above (like Owen & Beru’s moisture farm with a Jawa sandcrawler) check out Irwan’s photostream on Flickr.